We are looking to expand our team for 2019! 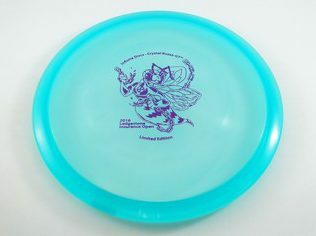 Are you a fan of the Infinite Discs brand? Are you a good example in the disc golf community? Do you regularly play in or promote disc golf tournaments? Are you active in online disc golf communities? Are you a really good disc golfer who would like additional exposure for your brand, a signature disc, and more perks for mastering disc golf? If you answer YES to several of these questions, you may be eligible for our team. We are looking for disc golfers all over the United States that will help us promote Infinite Discs and the sport of disc golf. You don’t need to be a 1000+ rated professional to apply, we also want enthusiastic amateurs, tournament directors and other ambassadors of the sport. 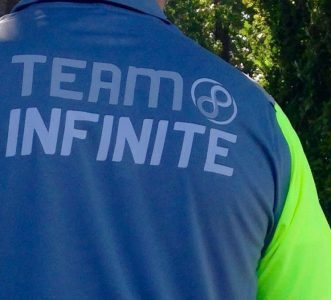 What does it mean to be on Team Infinite? Well, for one, it means you are awesome. We are building a sponsorship based on reciprocal exchange, sort of a “You scratch our back, we’ll scratch yours.” The perks you receive will be based on how well you promote our brand. Team Pack: “Team Infinite” Shirts, Infinite Stamped discs, bag tag, towels, mini marker discs and other accessories. A personalized 5% discount code, which you can share with your friends, family and those you meet on the course. Large Discounts on personal purchases (based on your PDGA rating). Extra help and sponsorship from Infinite Discs when you run leagues and tournaments. Member of the TEAM Facebook page where you interact with other team members and can provide input and insight on new products and news happening at Infinite Discs. Potential Paid Tournament registrations for accomplishing goals. Renewal Bonus– TBD. There will be additional perks if you fulfill our requirements and continue being an Infinite sponsored player after re-evaluation. Have an up-to-date Infinite Profile. This includes posting scores, writing course and disc reviews, and helping test our app as we continue to update and improve it. Please do not submit a team application until your Infinite Profile is updated (make sure to include a picture and detailed biography). You must participate in at least 12 disc golf events each year including: PDGA events, unsanctioned tournaments, instructional clinics, or anything else where you will be able to interact with a large number of fellow disc golfers. Take pictures at your disc golf events and post them on social media. Use the hash tags #TeamInfinite and #InfiniteDiscs. It’s fun to see what all of our team members are up to! Take pictures of scenery, great shots, your group, or other Team Infinite members. You cannot post your discount code publicly or share online. We understand that you may not be able to control what others do with your code, so we won’t punish you if it gets publicized. If we do find a discount code posted online, we will destroy the code and issue you a new one. Represent the sport in a professional manner. We hope that you will know what this means, but if you’re worried or have any questions, contact the team captain(s) for more information. Interact with our social media pages– Share on Facebook, comments on our posts, re-tweet, etc. when it makes sense to do so. The more you interact with our marketing efforts, the more it benefits us and helps your friends to see that you are part of Team Infinite. Do I qualify for Team Infinite? Role models in the disc golf community who actively work to grow disc golf. Regular participation in disc golf events and tournaments. It also helps (but is not required) if you have some skills on the disc golf course and regularly place well in tournaments. We want our team to be full of disc golfers from all walks of life, from all over the country, and of all sorts of ages and skill levels. Without question, the best way to improve your score in a round of disc golf is to make putts. With more than 100 different putt and approach discs on the market, choosing the right putter can be overwhelming. We understand that there is no putter which will be the best for everyone, and that this debate can never be fully settled. After all, we all have different styles and preferences. 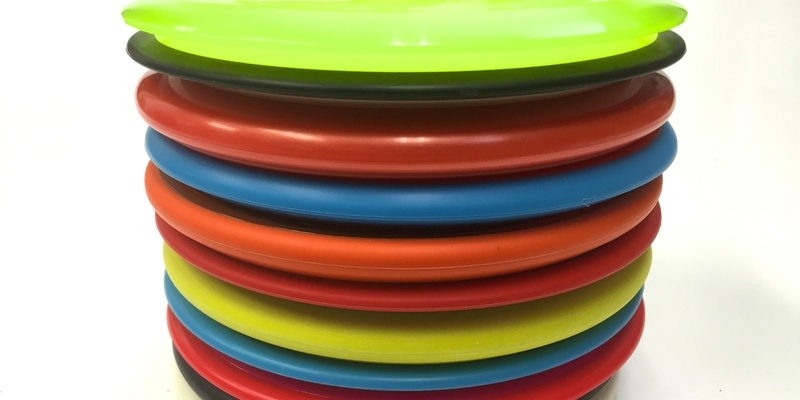 In an effort to help you determine which putt and approach discs are superior, we ask for your opinion, “What is the best putter for disc golf?” Please leave your comments to share what you love about your favorite putter. Two putters that made a splash and gained momentum from smaller brands were the Reptilian Discs Scale (overstable putter) and the Plastic Addicts Habit (an over-sized putter). Christmas is just around the corner. Golf discs make great, affordable, Christmas presents. Disc golfers love trying different discs and gadgets that make their disc golf experience more enjoyable. Here are a few ideas to help the non-disc golfer choose a winning gift for the avid disc golfer. Disc golfers love trying new discs. 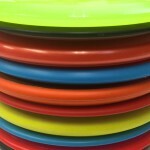 But with hundreds of different options to choose from, how do you know which Frisbee to choose? Here are a few of the hottest selling new releases of 2016. Newer technology and disc mold innovations continue to make disc golf technology better. There have been plenty of new discs released this year that flat out fly farther than discs of the past. Here are a few to consider. a DDX has been one of the most hyped up drivers ever. 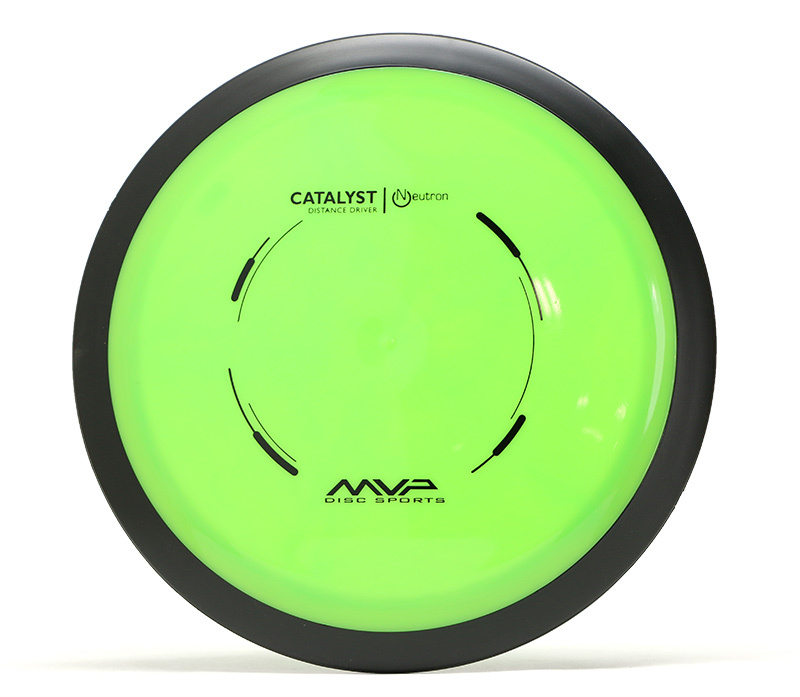 This disc is very similar to the Innova Destroyer which is the most popular distance driver currently on the market. 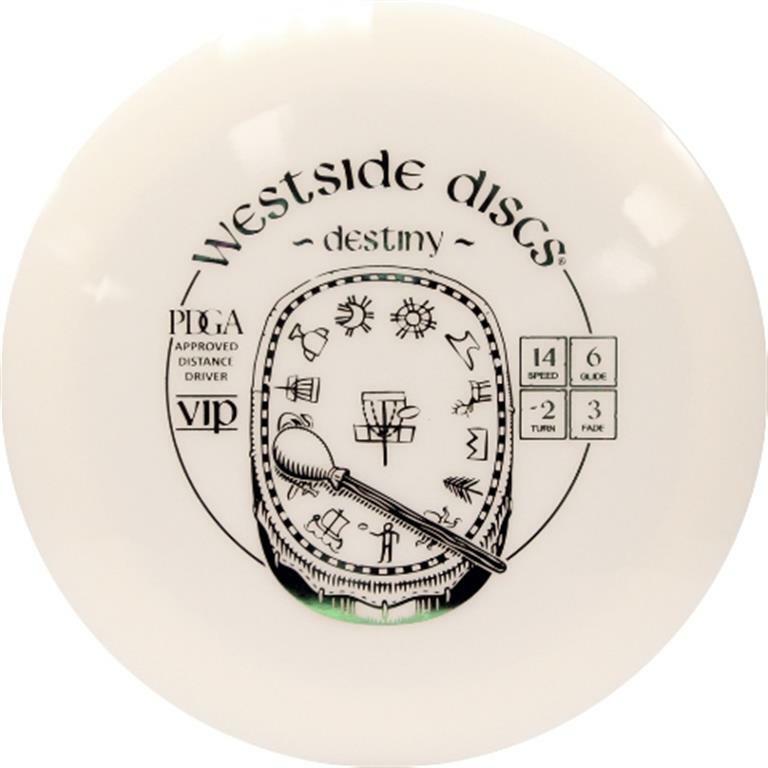 Westside Destiny – Every disc golfer wants more driving distance. The Westside Destiny is ultra fast and glides forever. There is a good chance your loved one will set a new distance record with the Destiny, and they will thank you every day because it was you who so thoughtfully bought one for them. he Catalyst uses multi weighted Gyro technology to produce a unique disc flight. 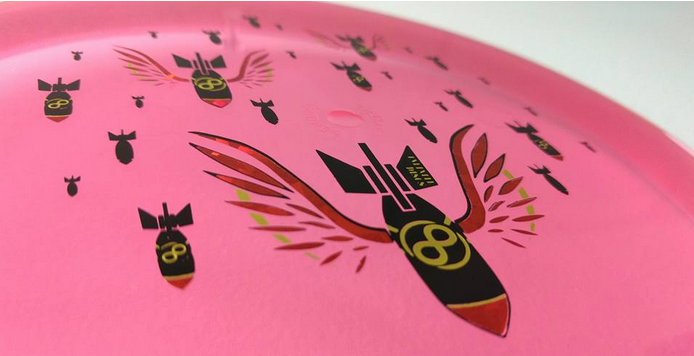 The most popular of these Gyro distance bombers released this year is the MVP Catalyst. Discraft Thrasher – Unlike many of the other major brands, Discraft doesn’t release a lot of new molds, but when they do, they are usually excellent. The Thrasher fits that mold. This is another distance bomber that is the perfect stability for max distance for the Intermediate Disc Golfer. Until a player develops adequate form, snap, and arm speed, distance drivers like those listed above won’t necessarily provide more distance, and will likely provide more frustration. For a newer player, consider one of these new discs. The DGA Sail is effortlessly controllable. This disc drives very well and stays incredibly straight for a frisbee golf driver. Vibram Onyx – For new disc golfers the Onyx has been described as a game changer. 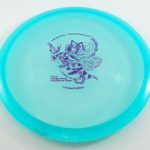 This disc is very easy to control and gets newer disc golfers more distance than just about any other disc. Discraft Buzzz GT – The Buzzz is the most popular midrange disc on the market. The Bangar Groove Top (GT) is one of Discrafts most popular putt and approach discs. As the official vendor of the 2016 Ledgestone Insurance Open, we were able to have a limited run of 500 of Groove Top Buzzes made. You might love the way the groove top feels, but if not there is no doubt that this disc is a thing of beauty. To search specifically for uniquely stamped discs, use our Advanced search. Simply select “Extras” then stamp type you are looking for. 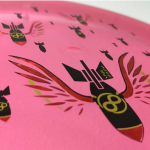 If you want to spoil your disc golfer with an entire years worth of new and collectible discs, then sign them up for the VIP club. On December 12th, 100 additional spots in the club will be made available for new members. 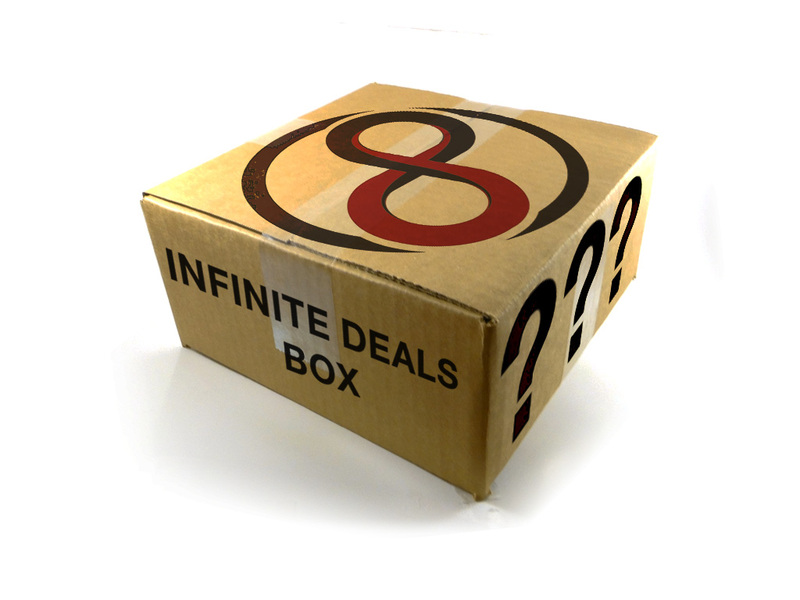 If you like value, where you get more bang for your buck, consider an Infinite Deals Box. This is the perfect sampler package for disc golfers of all skill levels. Each mystery box includes a combination of discs from collectibles to misprints. Each box is carefully selected to include discs with a variety of different flight types and discs from multiple manufacturers. If you don’t know exactly what you are looking for, this is the perfect, inexpensive, way to delve into a new spectrum of disc and plastic types. With an Infinite Deals box the average cost of each premium plastic disc is about half the normal MSRP, and your average cost per disc is less than $10 each! Every disc golfer I have ever met wants to improve their putting game. Improved putting comes through practice, and the easiest way to practice is to have multiple putters of the same plastic and weight. 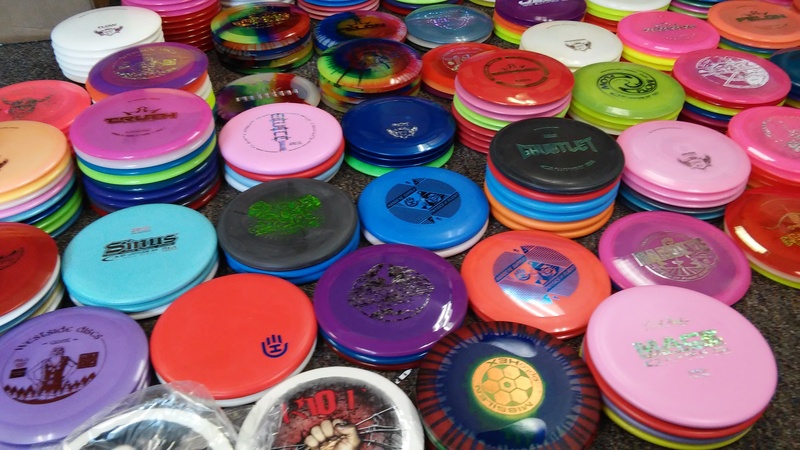 Figure out what putter your disc golfer is using, and buy them 6-10 more. If your disc golfer regularly plays courses with water hazards, the Golden Retriever will help him rescue his most favorite discs. This ingenious device makes it easy to fish discs out of the water. It’s small, light weight, and effective. For fishing out of streams and running bodies of water, the Disc Gator is the retrieving device of choice. The easy collapsing tent pole extends about 12 feet making it quick and easy to get your disc out of water or tall trees. If your disc golfer owns multiple discs, but doesn’t carry a bag, or uses something that wasn’t designed for disc golf, a small bag will make a great gift. The Infinite Discs starter bag offers the best value on the market and has a large variety of colors to choose from. 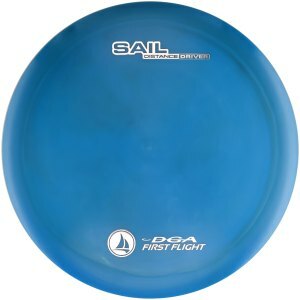 For the disc golfer who has a small bag, but is now really getting into the sport (acquiring lots of discs, playing in organized events etc. ), a larger bag ($30 – $80) or disc golf backpack ($70-$220) is an ideal Christmas gift. From a disc golfers perspective, there is something very satisfying about being able to carry enough discs to satisfy any shot you might face. The hottest trend for the serious tournament playing disc golfer right now is a disc golf cart. 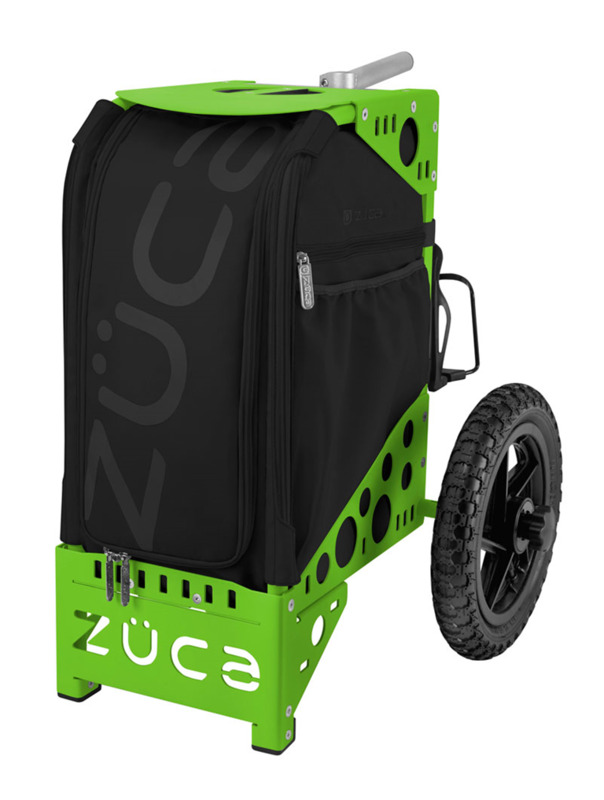 These things aren’t cheap, but there is no better way to show your disc golfer you really care about them than by gifting them a cart that will allow them to carry around 30+ discs without breaking their back. For a tournament playing disc golfer, the cart allows disc golfers to bring everything they need for a serious round of disc golf including a sweatshirt, jacket, umbrella, disc retrievers, backup discs, backups of the backups, large water bottles, and best of all it provides a comfortable seat anywhere on the course. For that extra special someone, a portable disc golf basket is a great gift that will really get them excited. Portable baskets are ideal to help improve putting, and for setting up temporary disc golf courses. My recommended portable disc golf basket is the DGA Mach Lite. Will Schusterick, 3 three time USDGC Champion, is not only one of the best disc golfers in the world, but is also a great disc golf instructor. This clinic at the Mulligans at Creekside Disc golf course in Ogden, Utah on October 20th, 2014 is full of tips to help you improve your driving, accuracy, and overall mental disc golf game. The video was filmed and edited by Cassidy Houdeshel. In this disc golf clinic one of the best sidearm throwers in the world, Ricky Wysocki, demonstrates tips he uses to get more distance and accuracy out of forehand/sidearm throws. Many disc golfers find it easier to get distance out of ‘flick’ throws when they begin playing disc golf, but few disc golfers get a full reach back on their sidearm throws. Proper grip for sidearm power drives. Recommended grip for consistent accurate approach shots. Alternative grips used by other top pros. Angle your arm should be at for different types of forehand drives. This clinic was filmed and edited by Cassidy Houdeshel. We recently hosted a pro clinic with Paul Ulibarri, Will Shusterick and Ricky Wysocki. These are three of the top disc golfers in the world, and members of Team Prodigy. Paul Ulibarri’s clinic focused on tips to help you improve your short game approach shots. According to Paul, the most underrated part of the disc golf game is getting up and down from 100 feet. He has four basic tips to improve your control and accuracy on approach shots. 1. Get in an athletic position with your soldiers square to the target. 2. Keep your eye on the target. 3. Get the nose of the disc up. Having the nose of the disc facing upward will help prevent you from overshooting the basket. To make sure the nose of the disc stays up, Paul recommends keeping your wrist above your elbow. 4. Follow through with your shot. Watch the full clinic video, produced by Cassidy Houdeshel right here. Throwing at night with an LED attached to your discs is a fun and amazing experience. We sometimes joke that during these “night rounds” of disc golf, that the authorities will be called due to sightings of UFO’s in the area. There’s really nothing quite like it. So get your warm clothes out, and keep playing at night! With an LED light attached to your disc in the dark, we find that it is easier to find your disc during the night than during the day. However, LED’s attached to your disc can have a few drawbacks. So we’ve put together some “best practices” to make your night round as enjoyable as possible. Need some disc lights? We’ve got a few! Buy Disc Lights Here! We actually use the same packaging tape which we send your orders out with to secure lights to the dis.. This is the Scotch packaging tape made by 3M, and it works perfectly. This is transparent tape. We have seen others use duct tape to secure the light to the disc; duct tape works very well, but will sometimes leave a sticky residue afterwards. If you have a dirt or oil on your disc, the tape will stick to that instead of the disc plastic. This will cause your light to fall of your disc when it comes in contact with another object. You can clean your disc off by rinsing and rubbing it, or you can actually clean it off with some dish soap like you’re doing the dishes. Do not use anything abrasive, unless you hate the stock stamp that came on your disc and you like scuffs. A gentle wash should clean your disc nicely. This is where advanced preparation is incredibly important. We suggest doing this a day in advance. If that is not realistic, at least a few hours in advanced. Take your discs inside and let them come to room temparature. Once warm, apply the tape (which should also be room temperature), and let the tape settle in and adhere for a couple hours. Some people will place the light on the top of the disc, or they’ll place it on the bottom with the light facing towards the ground. This is not the best way to place your light. The best way is to tape the light to the bottom of your disc, with the light shining through the plastic. This gives the light some additional protection, decreases drag above the disc, and gives you the most visibility. It may waterproof the disc light. Two lights flying look amazing, just like a UFO. We admit, we haven’t seen a UFO, but we’ve heard from others who have that this is what they look like. Also, two lights will decrease your chance of losing the disc, if one light comes lose. If you do so, understand that these lights are 2.9 grams (roughly 3.1g if you have taped them over), and will affect flight. You will not have the truest flight to what you are use to with that disc. However, to keep flight consistent, place the lights on opposite ends. It’s great that your disc is now visible, but unless you light up your target, you may be out of luck. Q: Are players allowed to tape LED lights on discs for night or winter play? A glow stick or LED light may be attached/taped to any PDGA Approved disc for use in sanctioned events where play occurs after sunset in that time zone. In addition, these lights may be attached to PDGA Approved discs for use during sanctioned play in daylight, specifically when there is sufficient snow cover on the course where the lights might make discs easier to locate. Non-PDGA Approved discs such as those with built-in LED lights cannot be used at any time during sanctioned play. So when the self-proclaimed PDGA police come out after sunset, you can grimly point them to PDGA FAQ. Most public parks have a curfew, or will not allow citizens to be at them after dark. However, if you inform your local law enforcement in advance that you are organizing an event they will more-than-likely be happy to let you hold your event after dark. Over time, your eyes will adjust to the dark. If you use a flashlight or whip out your phone to check Facebook, it will make finding your discs more difficult; especially if you have a buddy who is using his glow disc. If you are going to use a bright light, give your fellow players a warning so they can shield their eyes. What is your favorite course to play in the dark (don’t forget to tell us which state!). Are there any other “best practices which you would like to add? How often do you disc golf at night through the cooler months?